In 1951, while I was a high-school student, my girlfriend and I would make trips from Berkeley to the corner of Turk and Hyde streets in the Tenderloin. 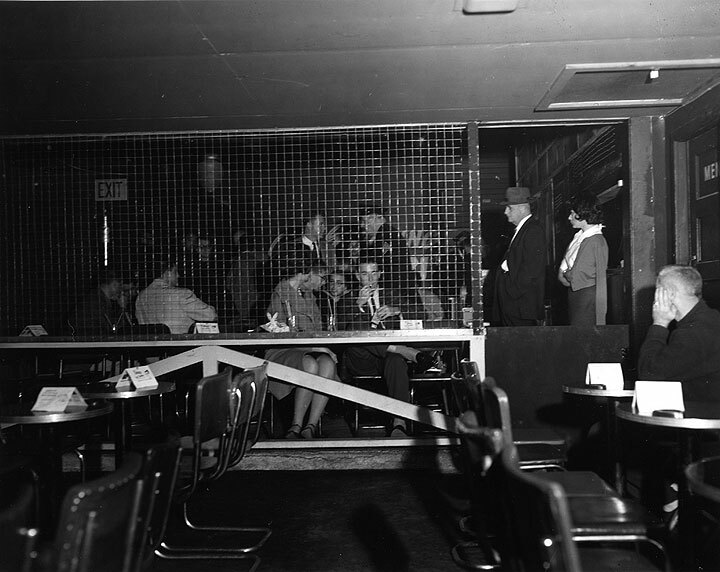 Here, at the legendary jazz club, The Blackhawk, we would be ensconced behind a chicken-wire barrier that separated underage patrons from their hipster elders. It was from this “cage’’ that we would “dig” the energizing sounds of Dave Brubeck, Gerry Mulligan and other jazz greats. 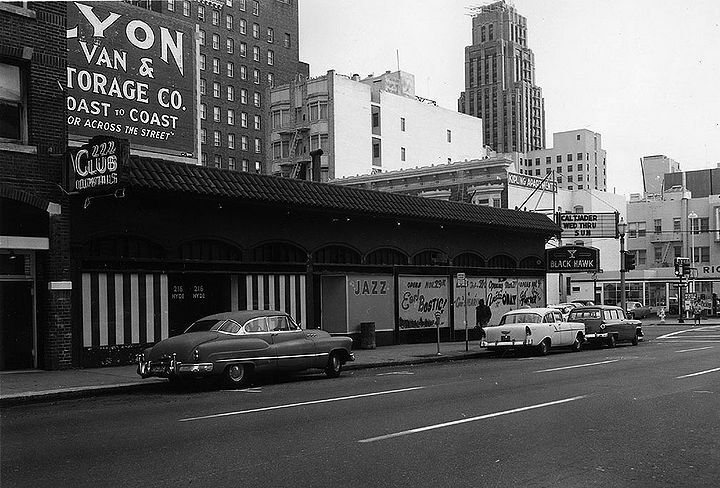 The Blackhawk at Hyde and Turk, January 27, 1961. The infamous chicken wire barrier behind which underage patrons could enjoy the wild jazz, 1961. I remember listening to Thelonious Monk at the Black Hawk in San Francisco in 1958. I was still a senior in High School. The Black Hawk had a little fenced off seating area where us "minors" could sit and listen. Monk had two whiskey glasses on the piano top. As he stood up at the break he held both glasses and shook them. The ice cubes made a ring against the side of each glass. He took what seemed a gulp out of one, then twirled twice in a little dance step then retreated through a side door. I never have forgotten the sound of those cubes: piano keys of another order. 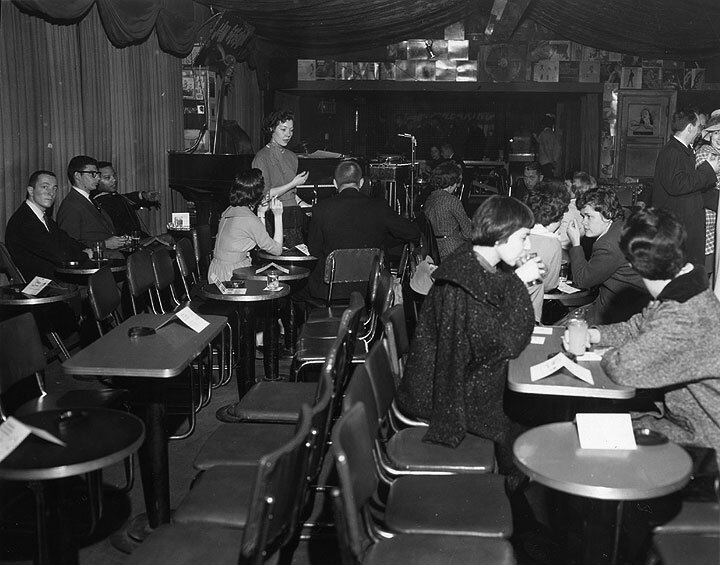 Interior of the Blackhawk, January 1961. 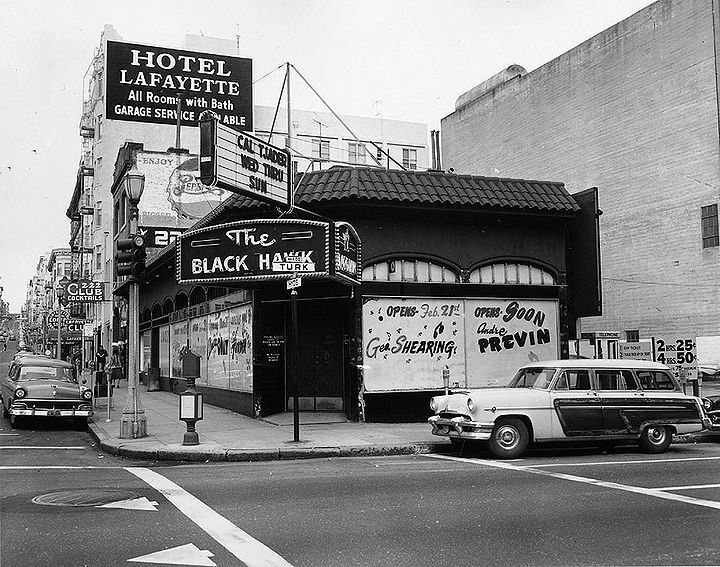 Young adult entrance for the Blackhawk at 216 Hyde Street, the day after a raid for violation of liquor laws, 1961. 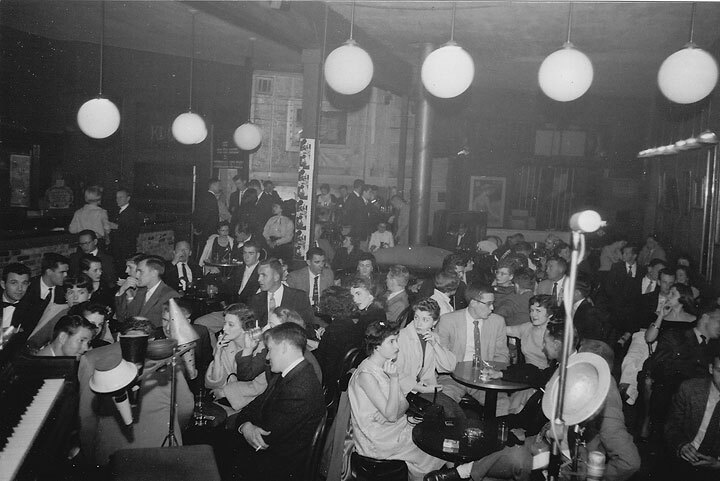 Ten years later, on returning to the Bay Area, I was able to drink with the big boys at The Blackhawk, but the jazz scene had shifted to North Beach, specifically to the Jazz Workshop, where the center of the action was at 473 Broadway. The Workshop was owned by lawyer Art Auerbach, who loved jazz but did not profess to be the sharpest of businessmen. Across the street from the Workshop was Sugar Hill where Carmen McRae was a regular. 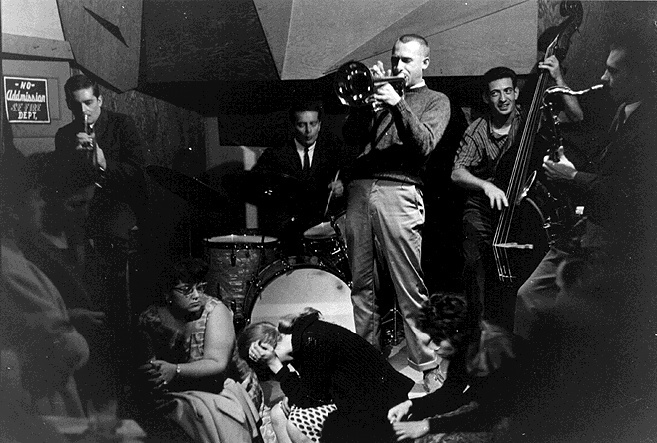 On one occasion she was joined by Dizzy Gillespie, who, between sets at the Workshop, braved the mid-block Broadway traffic to cross the street and join McRae on a couple of choruses of “I Left My Heart in San Francisco.’’ Also on the east side of the street was El Matador, the site of the now Horizon Lounge, which was owned by bon vivant and bullfighting enthusiast Barnaby Conrad. He hired John Horton Cooper as his house pianist, who, it was said, was able on a slow night to play piano and make chess moves at the same time. 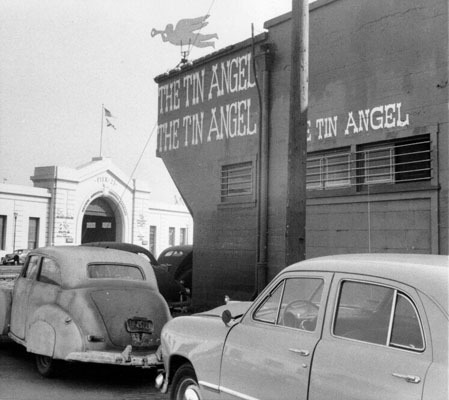 The Tin Angel, March 25, 1955. On one evening during this run, Russian composer Dimitri Shostakovich was in the audience for his first experience with American jazz. He made no comment, smiled appreciatively several times and applauded vigorously on occasion. One commentator noted, however, that Shostakovich and his entourage were probably the only audience members during these four weeks who did not move a muscle in time with the band. While the Workshop, “whose small space,” according to Hadlock, “was hardly able to contain the great music performed there,” drew large crowds that often spilled onto the street, running a jazz club, as Auerbach found out, was not an easy business. Not untypical was the case of Miles Davis, who in 1964 was supposed to play a two-week gig at the Workshop. Davis’ drummer was 18-year-old phenom Tony Williams. As California law did not allow minors in clubs that served liquor, Auerbach suspended his liquor license for the length of the engagement, charged a $2 door charge and served soft drinks. Davis then failed to appear on several nights, once claiming he had a tooth pulled. On some other nights he just didn’t show up. Auerbach had to refund the door charge to the disappointed audience members. Davis was very much his own man. Hadlock tells of running into him at the Blackhawk and mentioning that tenor sax player Hank Mobley was playing at the Jazz Workshop. Davis, intrigued, told Hadlock, “Let’s go.” One problem, however, was that the Blackhawk owner, who had always tried to avoid charging a cover, had found it necessary to add a $4 door charge to pay for the Davis run. 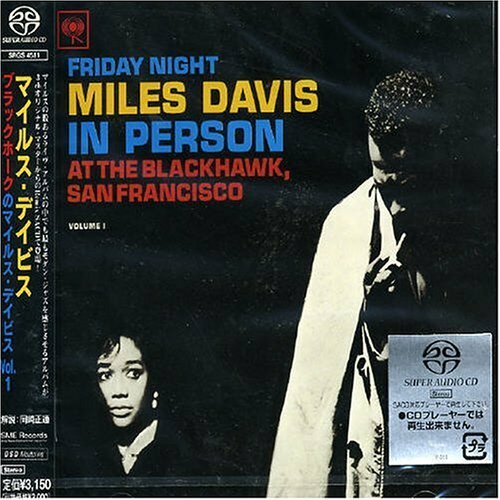 That detail didn’t stop Davis who left with Hadlock and stayed the rest of the night at the Workshop, not saying much other than commenting in his raspy voice on drummer Art Taylor. “AT never could keep a beat,” he said. Another musician who figured prominently in the Jazz Workshop scene was Charlie Mingus. A fierce and often scary showman, Mingus would sometimes crack a bullwhip during his performances. That ferocity was why Hadlock was concerned when, after he had written a not altogether complimentary review for Downbeat on one of Mingus’ albums, two men “without necks” stopped by the Workshop and asked, “Are you Hadlock? Mingus sent us.” That was enough to get Hadlock thinking he should stay arms length from Mingus. Not long after, when Mingus came to town, he was as friendly as he was capable of being and invited Hadlock to come hear multi-talented reed player Roland Kirk. Not all the neighborhood jazz during these years was on Broadway. Green Street, off of upper Grant, was also a hub. The Anxious Asp at 528 Green — now Tatoo Bogaloo — had on its juke box the largest collection of Charlie Parker records west of the Mississippi, as well as the pages of the Kinsey Report posted as restroom wallpaper. Down the street at 576 Green, a drab doorway now marks the entrance to what was once the Cellar, now between Caffeé Sport and Citibank. Today, as “gentlemen’s clubs” proliferate, dance palaces provide hook-up venues for the young and libidinous, and cops square off with would-be gangbangers on Saturday nights, the neighborhood jazz scene from 40 years ago seems ancient history. Those of us of a certain age, however, recall well enough the cramped and smoke-filled rooms where Brew Moore’s five chorus improvisations on “All the Things Your Are” were never enough.